Bombardier Flexity Swift high-floor light rail vehicle (LRV) delivered to the Bursa Metropolitan Municipality, Turkey. Image courtesy of Bombardier Transportation. Bombardier Flexity Swift low-floor trams of Melbourne, Australia, which are equipped with Bombardier's MITRAC propulsion system. Image courtesy of Bombardier Transportation. The Bombardier Flexity Swift low-floor tram of Melbourne's tram network can carry up to 210 passengers. Image courtesy of Bombardier Transportation. The Frankfurt Transport Authority (VGF) is one of the major operators of the Bombardier Flexity light rail vehicles and trams. Image courtesy of Bombardier Transportation. A Bombardier Flexity Swift high-floor light rail vehicle (LRV) operating on the city of Frankfurt's light rail network. Image courtesy of Bombardier Transportation. Bombardier Flexity Swift light rail vehicles help relieve congestion in the Greater Manchester urban area. Image courtesy of Bombardier Transportation. The Flexity family of light rail vehicles (LRVs) is manufactured by Bombardier Transportation. The LRVs have higher passenger capacity and run at a higher average speeds. They are also run as light or pre-metro services, where the vehicles often pass through underground sections. The Flexity light rail vehicles are operating in a number of light rail and tram networks in major cities across the world, including Manchester, Croydon and London’s Docklands (UK), Cologne, Frankfurt and Saarbrücken (Germany), Porto (Portugal), Bursa and Istanbul (Turkey), Stockholm (Sweden), Rotterdam (Netherlands) and Minneapolis (USA). Bombardier’s vehicles will also be introduced in Melbourne (Australia) and Karlsruhe (Germany). "In 2010, the Department of Transport in Victoria, Australia, signed a €216m ($282.7m) contract with Bombardier for 50 Flexity Swift LRVs." The Flexity family of light rail vehicles includes low-floor and high-floor vehicles. The under-frame is made of corrosion-resistant steel and the frame is of carbon steel construction. The cabin is built using stainless / carbon steel and glass-reinforced plastic (GRP) for front parts. The cab, aluminium roof and stainless steel sidewall (with aluminium cover) are separately built and bolted to the steel car body. The modules can be quickly exchanged in case of damage. The modular interior design allows integration of components according to client’s requirements. The low-floor vehicles are easily accessible, especially by disabled passengers in wheelchairs. Each vehicle has multipurpose areas for prams, wheelchairs and luggage. The low floor level makes them suitable for tram operations. High-floor LRVs can run on light-rail networks with platform heights of about 900mm. Tram-train solution is also offered for dual voltage operation. The driver is provided with an unrestricted view and advanced braking management for quick and efficient stopping. The vehicles offer optimum security and comfort for passengers, as well as cost efficiency, easy maintenance and a long lifespan for operators. The Flexity family of LRVs includes two base models, which are referred to as Flexity Swift and Flexity Link. Swift LRVs are bi-directional with cabs at the front / rear and doors on either side of the vehicle. The model is delivered in both low-floor and high-floor versions. It is capable of running at a maximum speed of between 80km/h to 100km/h. Flexity Link is offered as a dual-system vehicle suitable for urban tram networks and main railway lines. It is the first ever tram-train vehicle equipped with low-floor technology. The Link vehicles were introduced on Saarbrücken’s tram-train system in October 1997. Bombardier has introduced an LRV, called Flexity Freedom, for North American-based light rail operations. Bombardier also produces tram models under the Flexity family. The tram models include Flexity Classic, Flexity Outlook and Flexity 2. The Istanbul Transport Authority (ITC) placed an order for 55 Flexity Swift low floor LRVs in 2001. The Frankfurt Transport Authority (VGF) ordered 146 vehicles in March 2006. It is one of the largest contracts in the history of the light rail trade. "The Flexity light rail vehicles are operating in a number of light rail and tram networks in major cities across the world." VGF also placed an order for 78 Flexity Swift high-floor LRVs and ten Flexity Classic trams in December 2011. Deliveries are expected to be concluded by June 2017. In April 2007, Bombardier won an order from Transport for Greater Manchester (TfGM) for eight LRVs, with an option for up to 97 vehicles. The order was increased by four in October 2007. The first option for 28 vehicles was exercised in June 2008. The second and third options for eight and 14 vehicles were announced in March 2010 and August 2010 respectively. In December 2007 the Transport Authority of Rotterdam (RET) signed a contract with Bombardier for 43 Flexity Swift vehicles for the Erasmus and Caland lines. In August 2008, Bursa Metropolitan Municipality placed a €94m ($123m) contract for 30 Flexity Swift high-floor light rail vehicles. The Albtal-Verkehrs-Gesellschaft (AVG) and the Verkehrsbetriebe Karlsruhe (VBK) ordered 30 Flexity Link tram-trains in September 2009 for their network operations in Karlsruhe, Germany. In September 2010, the Department of Transport in Victoria, Australia, signed a €216m ($282.7m) contract with Bombardier for 50 Flexity Swift LRVs. The order also includes an option for an additional 100 Flexity Swift vehicles. Under the contract, Bombardier is responsible for mock-up and maintenance of equipment and vehicles until 2017. In February 2014, Rotterdam Transport Authority (RET) placed a €66m ($89m) worth contract for 16 Flexity Swift light rail vehicles. The LRVs are expected to be delivered by 2016 and will run on the new Hoekse Lijn in the Rotterdam area. 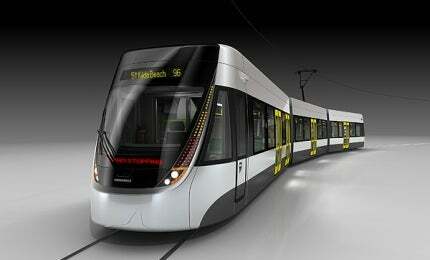 As of February 2014, Bombardier sold over 1,000 Flexity Swift LRVs worldwide.